We have a wide variety of equipment (as well as using our own software) which can be tailored to match your requirements. The Race Result system is our flagship platform and we now use it for 95% of our events. Cloud-based with immensely flexible software and features, the hardware is easy to deploy using interlocking detection mats or side-antennae mounted on tripods. Detection rates are second to none. 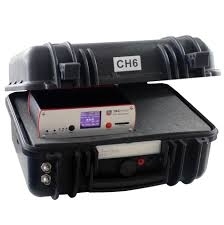 Decoder units have an 8-hour internal battery autonomy (which can be boosted to over 20 hours using our backup battery units) and may be deployed remotely with in-built GPS for time-synchronisation and GPRS modem for direct transmission of data to the cloud server. The same system will support both passive and active transponders, the lattter being suitable for higher speed disciplines such as road cycling, motorbike Enduro, etc. The software may be configured to match any requirements and is immensely feature-rich. Using this, we can offer integrated online entry, competitor management, real-time online results, online certificates and much more. Transponders come in a wide range of options featuring both disposable and re-usable options. Chips may be embedded in the bib number or race plate, fixed to the ankle or shoe or even as a relay baton! We have six decoder units for use at local events and the facility to hire additional units as required for larger events. This system gives us world-class capability at an affordable price that is scalable for both club and major events. Race numbers may be supplied separately or with embedded transponders. Graphics can be full 4-colour, which makes them perfect for inclusion of event and sponsor logos. They can even be printed with the competitor's name, club, category, etc! This system may be used for a wide variety of events including: Mountain Biking, Road cycling, Walking, Running, Triathlon, etc. Photo-Cells (light-beam). Or Push-button operation. Extremely high precision (1,000th second). Start & finish linked by cable which also supports a headphone link between start & finish area. Requires manual keying of race numbers to link start/finish times to competitors. Downhill Mountain Biking / Time Trial / Skiing and all races where competitors cross the finish line individually. No hardware (chip) carried by competitors. Start/finish may be up to 7km apart linked over cable, which also supports headphone communication. Ideal where only one competitor is on course at a time and they cross the finish line in the same order as they started. 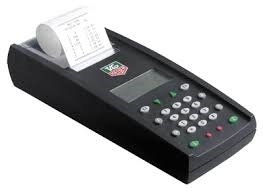 Requires manual entry of competitor numbers against times. Not suitable when competitors finish in bunches. In stock: We have two pairs of light beams, Race headphones and 2.4km cable. RC Transponders + Protime Decoders. 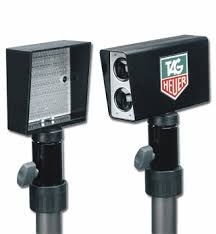 These are battery-powered transponders with a high degree of accuracy. They are specifically designed for road cycling, where speeds may be high - up to 120kph. Also suitable for Motorbike Enduro and any other fast-moving sport. Can also be used for running, mountain biking, etc where IPICO is not suitable. Can cope with fast-moving bunch finishes (e.g. road cycling races). Start & finish will link wirelessly up to 3km. 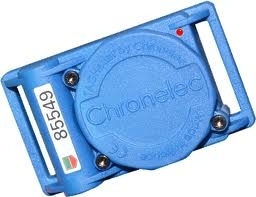 Transponders are expensive to replace (£48). Batteries need changing every 2-3 years. Will not stand immersion in water. In stock: We have 2 x Decoders + wireless link. 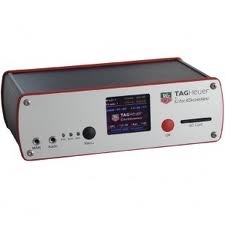 160 Transponders (can hire additional if needed). GPS-enabled for precise time synchronisation. Analog time of day clock face with second hand. Red-Amber-Green disc synchronises to count-down. Audible 5 beeps + GO signal. May be linked to light-beam & printer to confirm actual start times relative to planned start time. 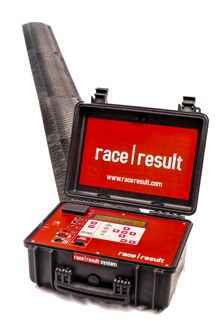 May be used to show precision start time at any event, but most suitable for time trials or individual starts. 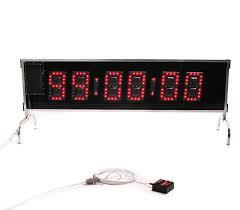 6-digit mechanical display shows time of day / count up or count down time. 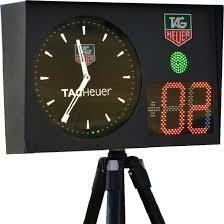 May also be linked to Tag Heuer software to show race time of competitor finishing, etc. Can be operated stand-alone or linked to a computer, which may be used to control the clock function up to 50m away (linked by cable). May be positioned at the start / finish line etc. 6-digit display shows time of day / count up or count down time. High intensity LED display which works well in both day and night time conditions. High Resolution digital camera which is invaluable as a finish line backup during mass participation events. Links into the Race Result timing software and shows synchronised images alongside time data.